Providing you the best range of spring testing machines with effective & timely delivery. 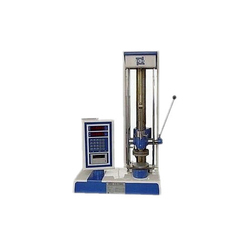 An exclusive range of Spring Testing Machine is available in various models to meet the needs and requirements of the market. We also provide customization as per the specifications detailed by our clients. These machines are designed in compliance with international quality standards and highly appreciated by our esteemed clients throughout the country. Our range of machines is used for testing various types of springs which are used in industrial applications. Looking for Spring Testing Machines ?